Resilient flooring - also known as 'vinyl' or 'sheet vinyl' - has been around for decades and is still one of the most popular types of flooring around. Mannington resilient uses innovative technology and showcases the best styles and designs in the industry. It's made using a printing process known as 'rotogravure', which prints a pattern on the flooring substrate via an engraved cylinder. Mannington resilient flooring uses ultra-low VOC, water based inks (VOC's are "volatile organic compounds", which can be detrimental to indoor air quality) and we make all of our vinyl products right here in the U.S. (at our New Jersey headquarters location). Combine that with easy maintenance and best-in-class warranties and you've got a floor you can love. You can select from stone, slate, or a wood appearance then select your performance level. Each pattern and color is available in each performance level. Styles vary from unique patterns to hand-scraped rustic. The most budget friendly option that offers a vinyl wearlayer and a six year warranty. Offering a more durable top layer called, Urethane Wearlayer, and a 10 year warranty, this performance level makes an ideal option for busy households while remaining mid-level in cost. The best of the best when it comes to durability; this performance level features the ScratchResist Wearlayer and a 12 year warranty great for heavy traffic! 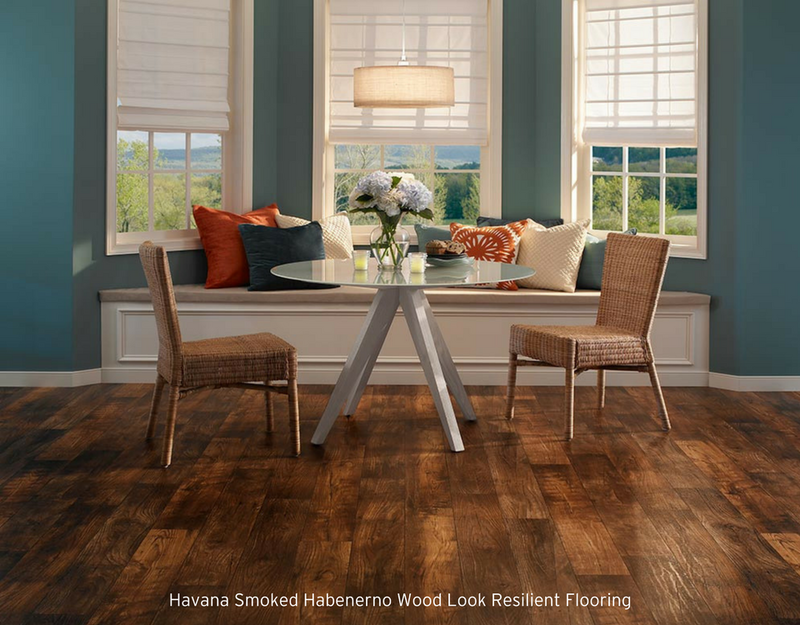 For best, long-term performance, our professionals will install your Mannington flooring but it does not always require as much preparation work such as hardwood or tile making it more affordable to install. It’s important to maintain your floors using proper cleaning techniques and a few tricks like doorway mats where heavier traffic and dirt is more likely to cause damage over time. Purchasing new flooring is an investment and we understand how important it is to make the right decision! That’s why we have rigorous warranties available to keep your floors protected and looking beautiful for as many years as possible! Our vinyl flooring complies with strict indoor air-quality standards and provides a dust-free, pet dander-free and allergen-free environment. We also strive to promote sustainability in ways such as decreasing waste through recycling materials and participating in green programs such as LEED. We'll contact you to discuss your project goals!